I just adore flatforms at the moment!! 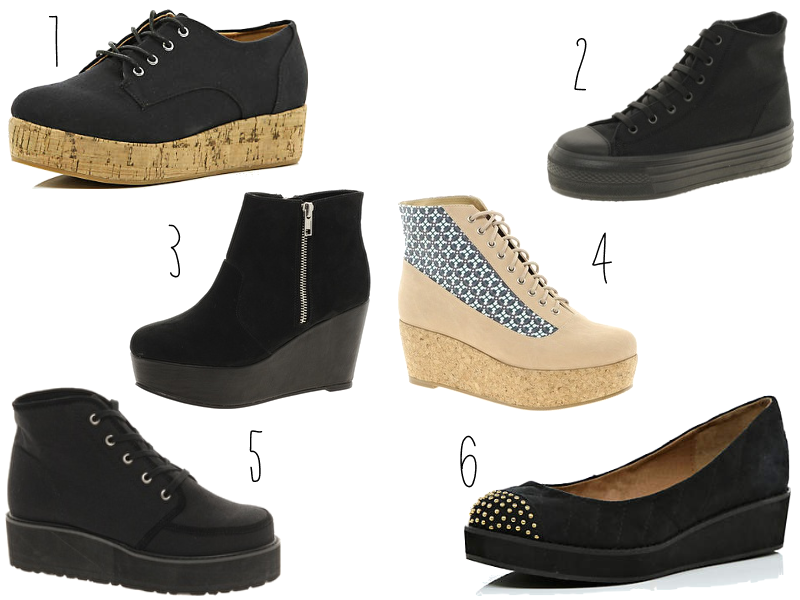 I find flatforms are a slightly more feminine than the recent creepers trend which I’m not too keen on. I was devastated when I received a bargain pair of simple converse style pair of flatforms from boohoo because of how awful they looked. They were ridiculously small, wide and overall cheap looking, so I am left still searching for some more! I remember seeing a grey River Island pair very similar to number 1, I was unsure at the time but now I wish I bought them! Number 2 are a really simple style and I’ve seen them pretty cheap on a few online places. I think number 4 are definitely perfect for the Spring season approaching as the colours are so calm and pretty! I’ve seen one or two blog posts featuring number 5 and I’ve certainly fallen for them but I’m a bit concerned they’re too wintery now. I really need to start buying stuff as soon as I see it, dammit. "REVIEW: THE BODY SHOP EXFOLIATING WASH"